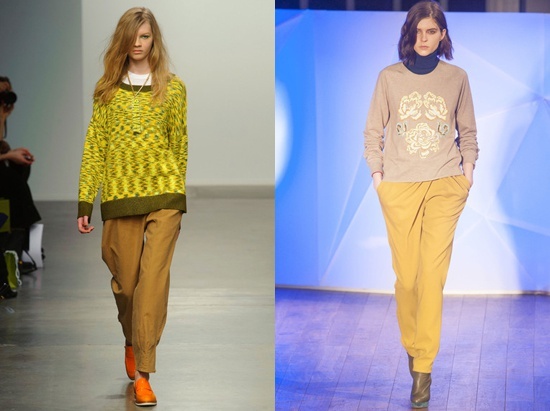 The mustard color pants – the garment that became a trend for 2015. If you have already had such a novelty, you just need to know what you can wear these trousers to look fashionable, stylish and interesting. What to wear with mustard pants? Mustard color is a warm color, so it perfectly combines all the warm shades, but some cool colors also pretty good with him in harmony. Choosing an outfit for a companion in mustard trousers, mainly need to determine the theme of the event to which you are going. If you are planning to go on a business meeting or work, in this case it is better to stop your choice on top of the clothes in classic colors. You can't go wrong adding mustard pants stylish monochrome blouse in beige or chocolate color. If you have to go to meet with friends or to a restaurant with your loved one, then complement the mustard pants outfit with brighter colors. Stylish top or shirt in blue, orange, pink or swamp-green hue will be very helpful. Women's trousers mustard color is quite interesting to look red, if you decide to create such a unique look, remember that the kit must be supplemented by accessory in a bright color the "top". Ideal - the red shoes or bag. Depending on cut the mustard trousers can be combined with clothes of different styles. For example, tight-fitting trousers would look great with a classic fitted blazer and high-heel shoes, model wide cut with sneakers or flats, baggy top and bag-postman.